​The Rifat Chadirji Prize is a thematic open international prize focuses on proposing designs responding to local challenges in Iraq. This prize aims to introduce Iraq and its challenges to the world and invite them to submit their ideas and to establish an uncompromising open source of ideas tackling social issues in Iraq through design.​ The current situation in Mosul would overwhelm the capacity of the formal market to incorporate the masses of refugees arriving to the city. Direct imitations of Western models that were designed for another culture are creating an alien environment in Middle East communities. Another housing policy, that fits the distinctive situation is needed. 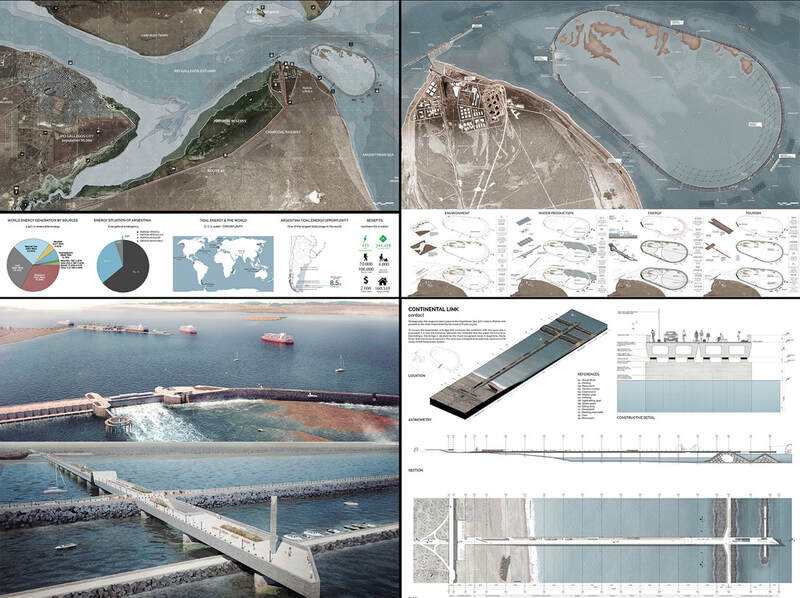 ​​The Second Prize winners of the 2017 cycle are Tomas Pont, Stefano Romagnoli and Juan Cruz Serafini from the National University of Cordoba in Argentina, for their work on “Global Energy Landscapes”, this graduation project was supervised by Javier Giorgis. 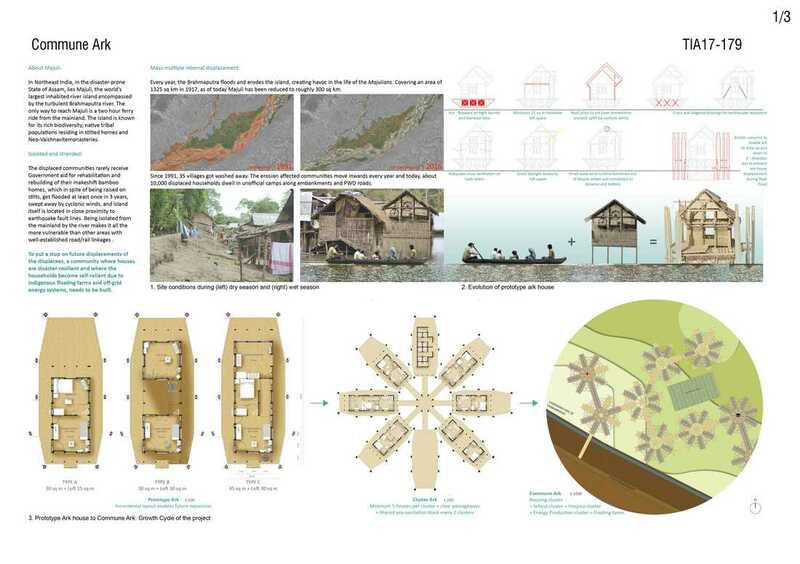 ​The Third Prize was awarded to Prachi Metawala from the Sir J.J. College of Architecture, Mumbai – India, for her graduation project “Disaster Resilient, Self-Reliant Community for Displacees on Majuli Island, Assam, India”. Tamayouz Excellence Award is a growing awards and scholarships program that was launched in 2012. It was founded by Mr Ahmed Al-Mallak, Lecturer at Coventry University which is the main award sponsor, the award started with only two student categories and has since grown to a global competition with 7 categories and competitions that is aimed at tackling global issues and enhancing the built environment for inhabitants. Tamayouz Award is open for architects,students,academics and architectural technology engineers worldwide to present their ideas and be rewarded and recognized for their effort. ​In Iraq, as an estimated 900,000 people return home to the city of Mosul after liberation, many of the returnees will only find desolation. The Tamayouz Excellence Award, Rifat Chadirji Prize focuses on bringing global awareness as well as global talent toward addressing the social issues Iraq faces through design. This year’s theme, “Rebuilding Iraq’s Liberated Areas: Mosul’s Housing Competition” asked applicants design prototypes for affordable housing. The winning housing proposals selected by the jury are practical, inspiring, and scalable, while adding capacity and density. The competition received 223 submissions from 42 countries. The Top 20 entries will be featured in a traveling exhibition that will visit Amman, Baghdad, Boston, Beirut, Milan, and London. 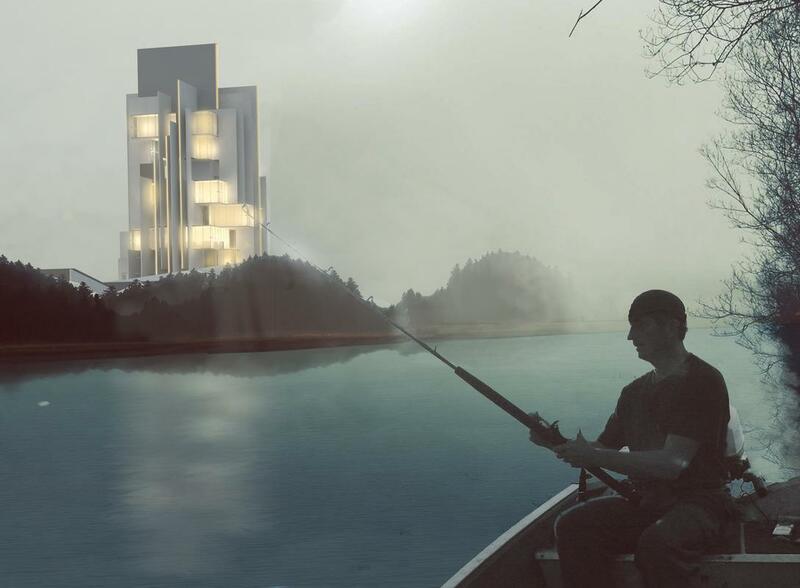 Read on to learn more about the three winning proposals and seven honorable mentions. Tamayouz Excellence Award is an international architecture award that aims to celebrate the achievments of young architects and designers world wide. It is judged by a renowned International Judging Panel. The purpose of this architectural design award is to recognise the excellence in architectural design and education worldwide and showcase excellent architectural examples to promote and provoke architectural debate to share architectural experience and knowledge among young architects and academics. 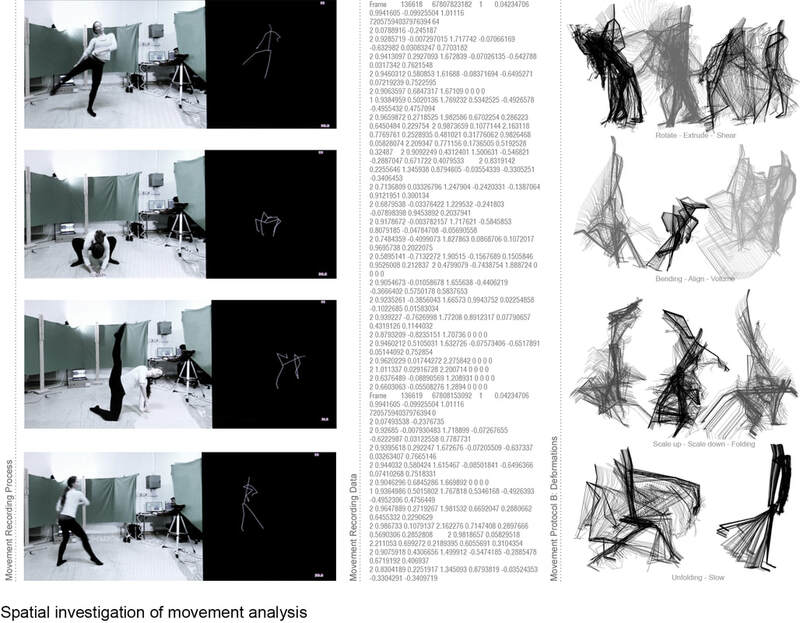 ​Dimitra Gkougkoudi and Elli Athanasiadou from the Aristotle University of Thessaloniki are winners and honorable mentions for their Choreographing Space graduation project, supervised by Maria Vogiatzaki. Tamayouz International Award for architectural excellence aims to recognise the excellence in architectural design and education worldwide and showcase excellent architectural examples to promote and provoke architectural debate to share architectural experience and knowledge among young architects and academics. 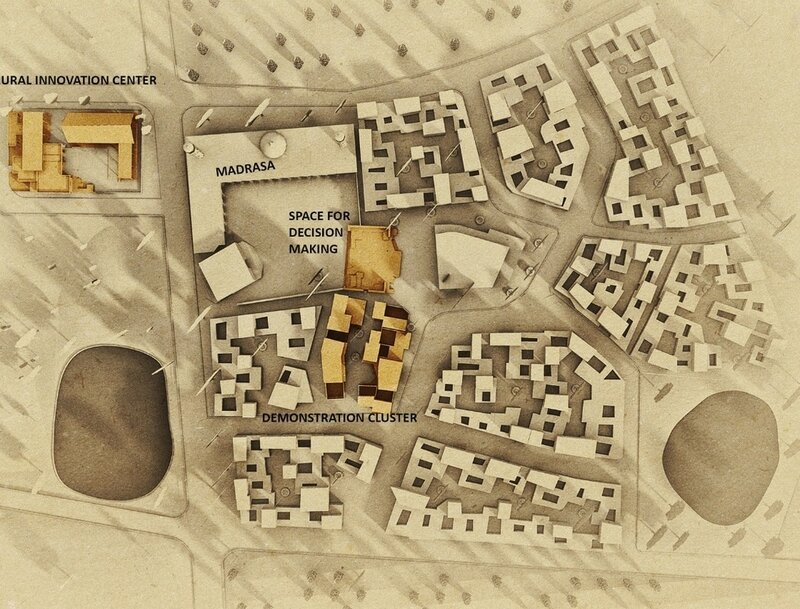 In the first cycle of the international student's category , honorable mentions celebrated their success alongside winners.The Eighth place was awarded to Zaid Al-Kawaz from the Applied Science University in Amman for his Conservation and redevelopment of Jadid Hasan Basha Quarter graduation project, Zaid’s project was supervised by Mazen Al-Nabulsi. 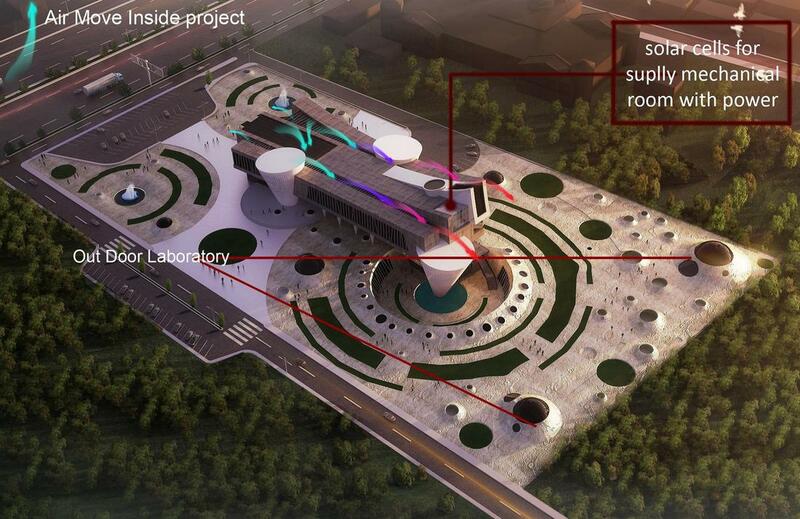 7th Place winner: Redefining Waste - Balsam Ibrahim, Hakem Al-Habahbeh and Odai Haddad - Jordan University: Tamayouz International Award for Excellence in Architectural Graduation Projects. In 2016, Tamayouz Excellence Award has grown from a local award to an internationally recognized award judged by a renowned International Judging Panel.The purpose of this architectural design award is to recognise the excellence in architectural design and education worldwide and showcase excellent architectural examples to promote and provoke architectural debate to share architectural experience and knowledge among young architects and academics. Celebrating young architects; the international students category focuses on supporting talent and innovation. The Seventh place was awarded to three young architects, Balsam Ibrahim, Hakem Al-Habahbeh Odai Haddad from the University of Jordan for their graduation project Redefining Waste, supervised by Dr Wael AlAzhari. ​There has been a rise in the amount of waste being generated daily by each household all over the city; this project serves as an experimental prototype of an environmentally sustainable decentralized municipal solid waste management model in the city of Amman, Jordan. In its first international cycle, the award witnessed an overwhelming participation of 420 graduates from 88 universities and 30 countries, 51 entries were long listed, followed by 20 entries shortlist. In 2016, the first cycle of the international students awards was launched; celebrating the achievements of young architects worldwide. Amazing projects made it to the top 5 list and the Fifth place was awarded to Ruaa Al Janabi from Ajman University of Science and Technology - UAE for her work on Baghdad University Student's District, Ruaa graduation project was supervised by Mohammed Arar. Tamayouz International Award for architectural excellence is an annual international award open to architecture students worldwide. Tamayouz International aims to recognise and reward excellence in architectural design and education by celebrating the achievements of young architects at an early stage and giving them the opportunity to collaborate and support each other, empowering a generation of young architects to pursue their careers knowing that they can contribute towards the advancement of architecture in their communities. 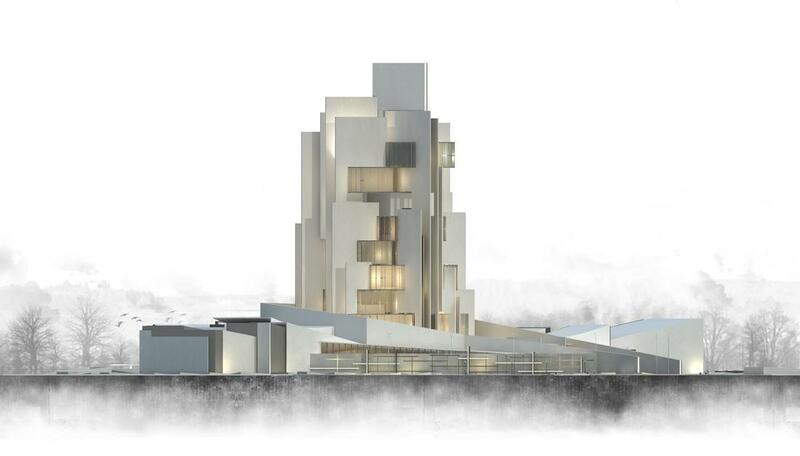 ​In the 2016 Cycle ,the Fourth Place was awarded to Horia Mihai-Coman from the Technical University of Cluj-Napoca Romania for his project; Music Academy Campus in Cluj - Napoca. This project was supervised by Dr Arh Radu Șerban Spânu. ​لقد كنت ضد منافسة صعبة طوال حياتي، وأنا لا أعرف كيف سوف يكون التقدم دون ذلك". والت ديزني"
​Tamayouz International Award is an annual international architecture that aims to recognise and reward excellence in architectural design worldwide. 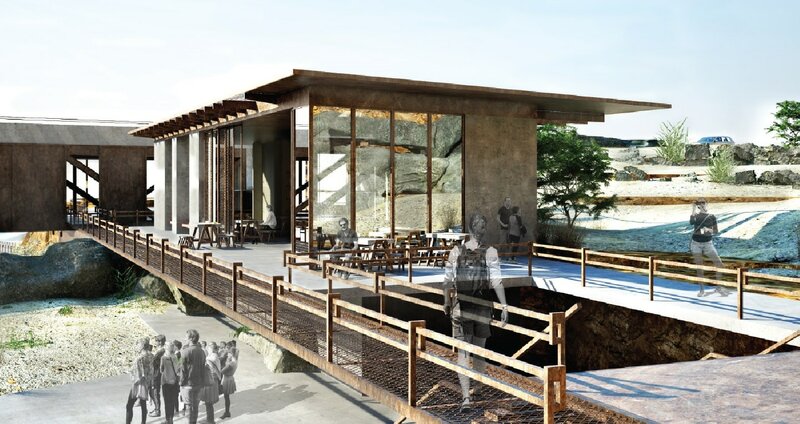 It is empowering a generation of young architects to pursue their careers knowing that they can contribute towards the advancement of architecture in their communities. Lama Alhamed and Tamara Al-Safadi from the University of Jordan are second place winners of Tamayouz International Award for architectural excellence 2016, for their work on The Panacea – Community Centre, a graduation project that was supervised by Dr Saleem Dahabreh. The Judging Panel described the project as an intriguing project on all aspects of ‘recycling’ and creating circular concepts not just related to energy, waste and material, that extended into the social domain. 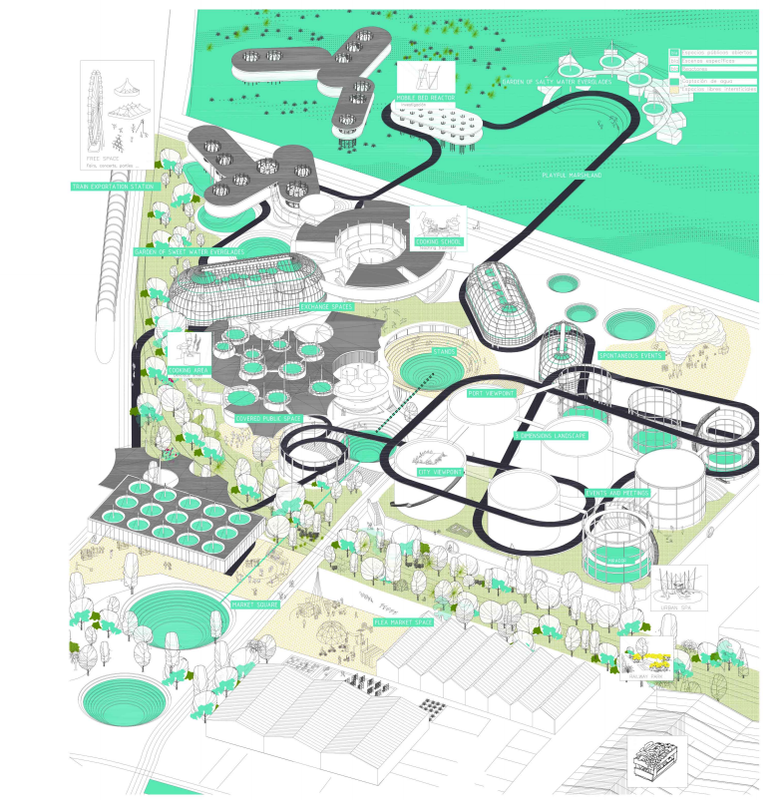 The design entails a kind of urban catalyst, to provide both a machine for a sustainable lifecycle in the urban neighborhood, but also multi-use spaces for workers, residents and visitors. 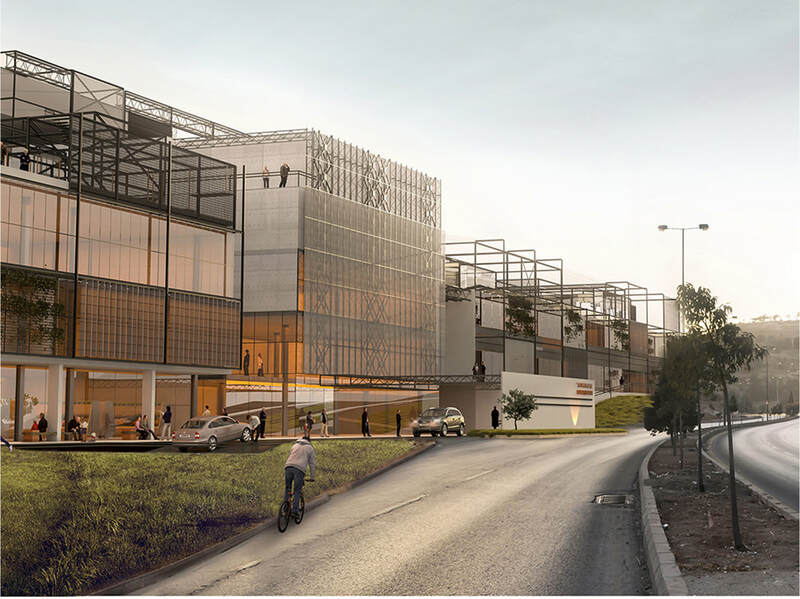 The combination of an industrial function and urban services creates an exciting – slightly idealistic – vision of a new architecture for distressed areas in Amman. 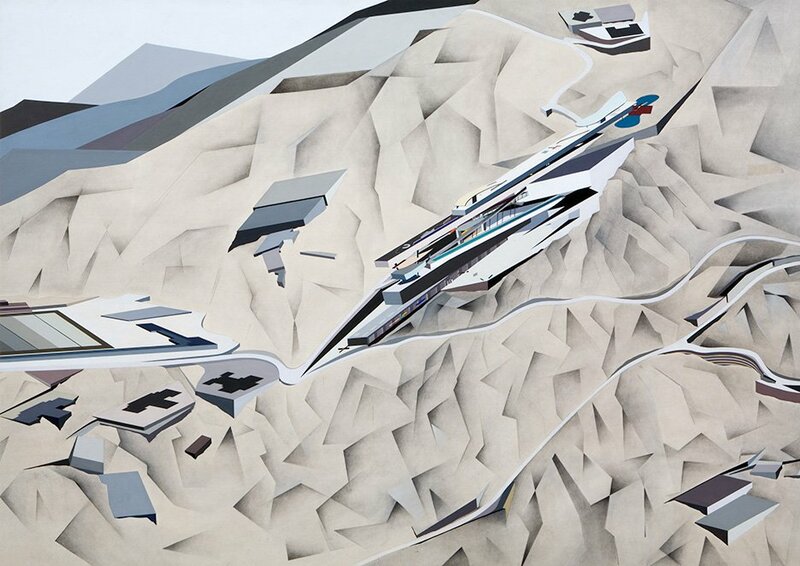 Tamayouz International Award is an annual international architecture award open to final year students worldwide. Tamayouz International aims to recognise and reward excellence in architectural design and education and celebrating the achievements of young architects at an early stage and giving them the opportunity to collaborate and support each other, empowering a generation of young architects to pursue their careers knowing that they can contribute towards the advancement of architecture in their communities. The Winner of Tamayouz Excellence Award 2016 and the First Prize is shared between Anna Andronova from the Kazan State University of Architecture and Engineering in Russia and Noor Marji from the German Jordanian University in Amman. The judging panel of Tamayouz Award described the project to be an impressive and provocative solution, not only for a very sensitive and difficult area in Amman but also as a bold attempt to reshape education through socially and value oriented architectural design. The final design is a convincing public space and public venue that will immensely contribute to the livability of the neighborhood, providing schools, library, sports facilities and a large amount of public space. 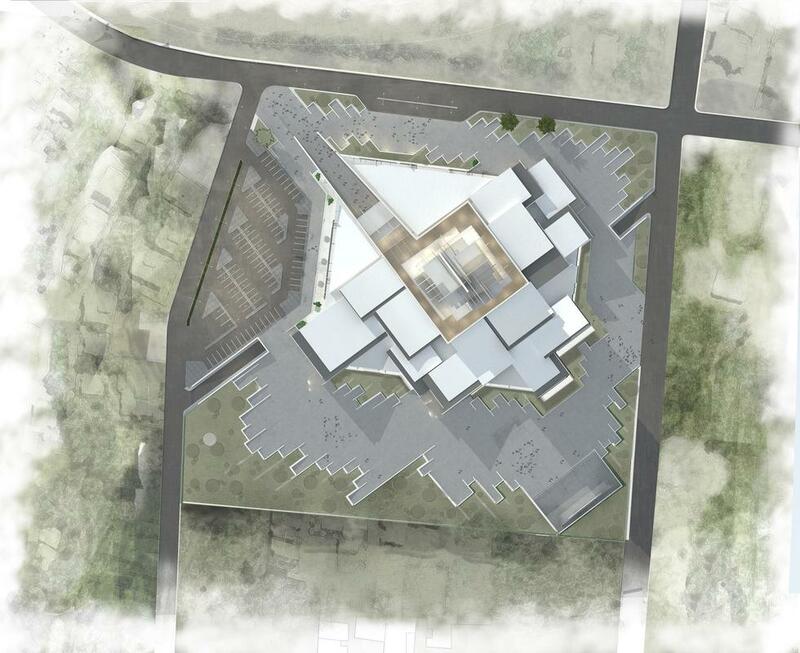 The building could become a social connector and social catalyst for change even more than it does already, by examining lateral connections to the site around it. An appropriate solution for bringing a substantial program into a dense urban area. Due to the variety of adventure sports the nature of Wadi al-Mujib offers, the number of visitors reached 20,000 by 2012, which is the largest compared to other reserves in Jordan, which was a reason for some architectural interventions in the area related to eco-tourism. The presence of Mujib’s permanent-flow-water in a dry country like Jordan led the Ministry of Water to creating a diversionary dam at the Mujib Siq entrance, where water is harvested and transformed to treatment plants and then pumped to the north. 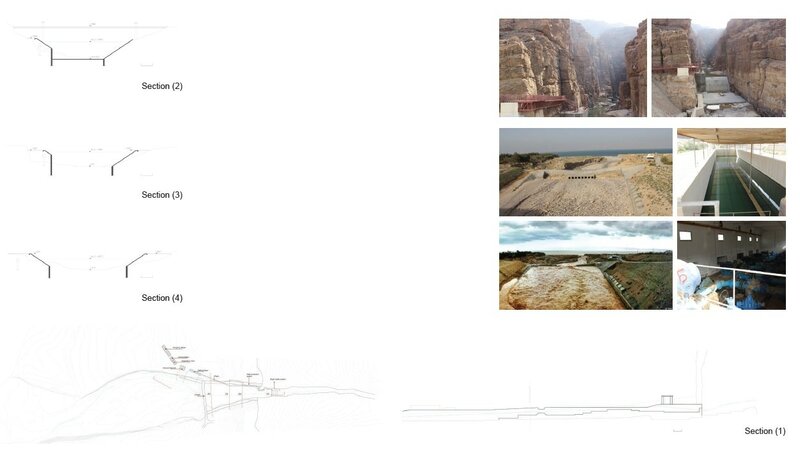 When Mujib valleys unique natural phenomena is to be interpreted in an architectural project, not only its natural value will be the topic of interpretation, but also the human impact and the manmade structures in the area, are important parts of the process. Therefore, this project aims to exhibit both landscape and infrastructure, by folding itself in the landscape delicately with a simple and elegant construction that is respectful to the context and environment. The western buffer zone of Mujib reserve was selected as the area of study. Human access to the reserve, the end-flow of water, water harvesting, treatment and pumping, eco-tourism, all happen in this part of the reserve. The construction of the dead-sea highway on the edge of the western boundary of Mujib reserve, allowed people to reach the area by driving between north and south, and entering the reserve starting an unofficial eco-tourism in the wadi’s in the late 90’s, therefore the RSCN decided to organize these activities and confine them in certain canyoning and hiking trails. 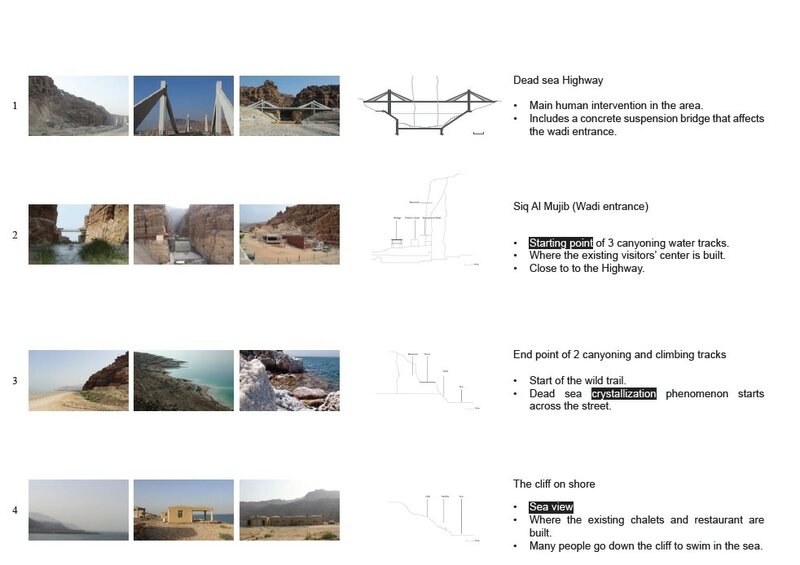 A visitors’ center was built and recently renovated and expanded adjacent to the entrance of Siq al Mujib where all canyoning trails start, while the end point of most of the trails is 1.5 km far from the starting point -to the south. On their way back to the starting point, eco-tourists have to walk on the side of the highway to reach the visitor’s center, and if they are staying for an overnight in the Mujib chalets which were built along the coast in 2008, they should cross the highway and walk the sloped terrain down, interrupted by the wired pumping station. The existing interventions in the area had rational reasons to exist each in where it is currently placed, but not necessarily in the present way of implementation. Dependently, the project’s area and quality was determined. 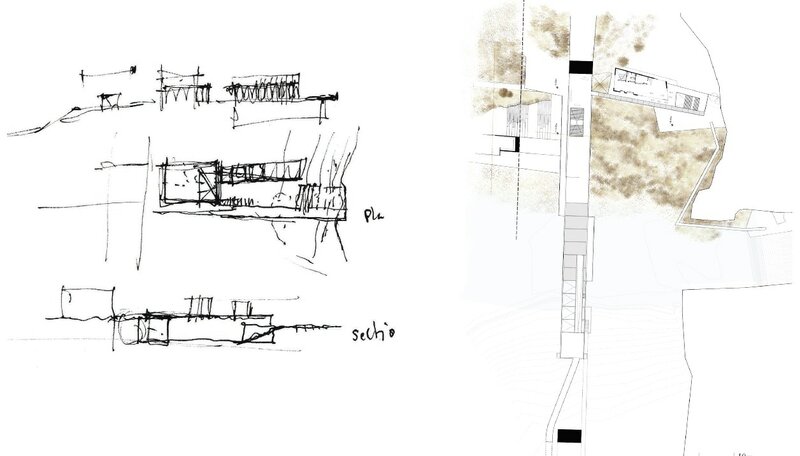 The located infra-structural and architectural interventions generated from certain human-needs linked with the area, either related to transportation (dead-sea highway and bridge), water (Mujib levee and water pumping system), or eco-tourism (visitors’ center and chalets), however the network connecting these interventions was not planned in a comprehensive manner, which made it hard and unsafe to move from one point to another. The approach in this project relies on the traces of these existing structures without expanding the footprint on site, while preserving and encouraging human movement in it. The Third Prize goes to Ali Nashwan from Mosul University (in Kirkuk) for his project; Nano Technology Research Centre. Ali’s graduation project was supervised by Professor Ali Haider Al-Jameel. 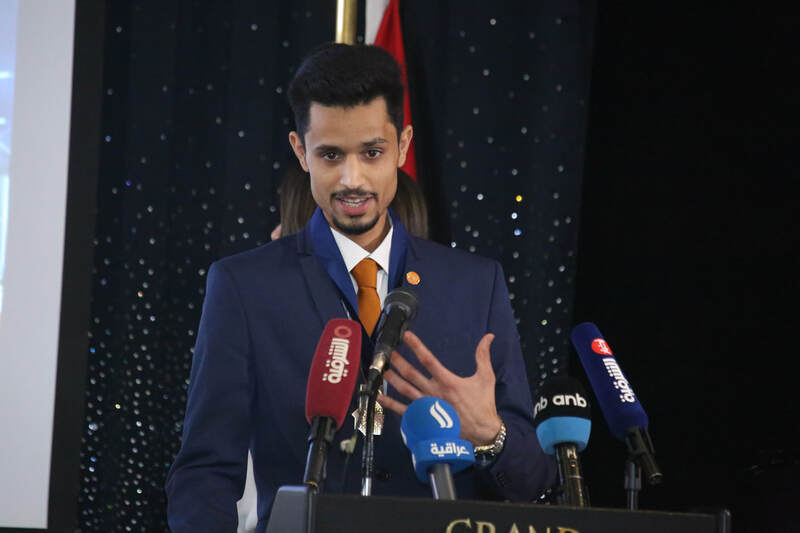 Ali is the only Iraqi student who made it to both shortlists; Tamayouz International (Top 20) and Tamayouz Iraq (3rd Prize) with two different projects, A remarkable achievement coming all the way form Mosul University in such a difficult time. 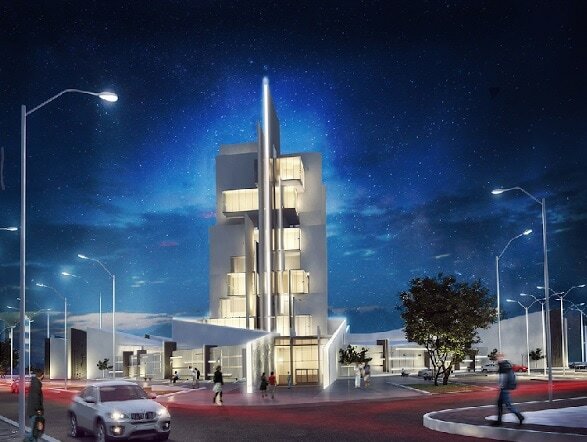 The Judging Panel Commented on The selection of project function and the site in proximity to a university and described it to be well set up, the project shows good design development and the designer masterfully sets up an appropriate setting for the habitable blocks. The use of geometry is beguiling and sets up a lovely urban condition. Ali Nashwan describes his project as a Celebration of the process of nanotechnologies. The device consists of a needle (Tip) passing over the surface to be scanned, the needle is installed on horizontal holder (Cantiliever) so that the needle is perpendicular to that holder and perpendicular to the surface at the same time, the holder is rising and falling with rising and falling of the needle according to the terrain in the surface, where the needle read the coordinates of the points of the surface to be scanned and give them to the computer to form a three-dimensional surface and zoom it in millions of times. When the needle is approaching from the sample surface, a force between the needle head and the surface of the sample is generated and this leads to a deviation of arm and read the surface. The resulting forms after the scanning process is a 3D spherical forms and often vaulted surfaces similar to the moon. The basis of the design idea is the (AFM), there will be a contact between the (AFM) device and the surface of the sample, Where the Earth's surface is the surface of the sample and the blocks above the ground is the scanning device (tip, cantilever). In order to simulate the forms of scanned surfaces and get similar forms on the ground surface of the project, Laboratories placed underground to get the topography of the earth surface by natural skylight as shaped domes, and making a big hole with a circular shape for getting topography where there's a tip descends in the middle of the hole., And an outside laboratories and seating areas in the form of domes have been made. The building is consists of three cones each cone represents the (tip) on the surface of the sample in a particular position. The building also consists of three rectangles each rectangle reflects the case of the device during its movement over the surface, The self-similarity strategy has been used in the formation of the project, which meets in the context of the scale nanoscale. Which cannot be seen only through microscopes on the one hand and pictures of the universe scale of space on the other hand, which can only be seen through a telescope, where the surfaces of nanoparticles is similar to the surfaces of the space and the moon. The same material has been used to cover inside and outside parts of the building, by using nanotechnology to process the surface of the material to become suitable for ​exterior and interior use. ​Also the function side were taken big space from the design. And I used the type of lab building. Sattar Flaih from Babylon University is the winner of ​The Second Prize of Tamayouz Award- Iraqi Category for his work on the Interaction Center Project; Sattar’s work was supervised by Dr Hassan Al-Guesbi. Sattar is the first student from Babylon University to make it to the Tamayouz Top 10 of the Tamayouz Iraq Award. The Judging Panel described the project as a balanced project in all, and commended the skilfully executed form that integrates well with the river and its own site and very well presented. Sattar Flaih, Describes his project to be a vital multi use project of social, scientific and environmental interactions. Which provide a real new chance to change the every-day life routine. Sense-experience subjectivity can be controlled and guided to desired common-sense effects. New materials, tools and technologies are experienced here in different interaction spaces. One can relate to others physically and sensually by virtual reality techniques and advanced smart applications. 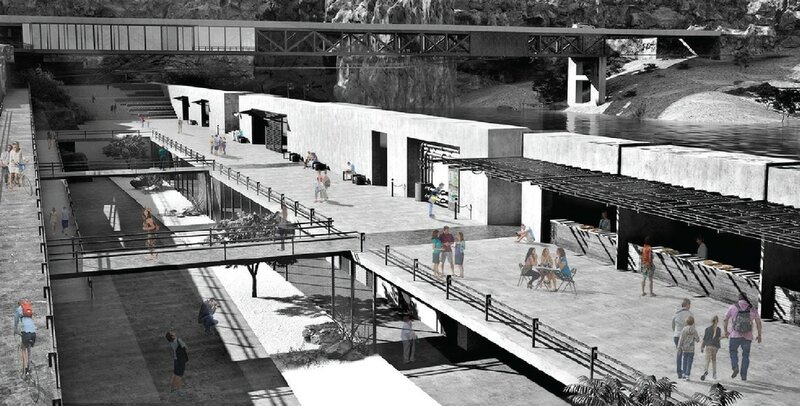 The project is located at the east bank of "Shat Al-Hillah", a branch of Euphrates river, which extend north of about (5) km reaching the remains of the famous city of Ancient Babylon. Also, the river streams down across the city of Hillah with a remarkable cornice. 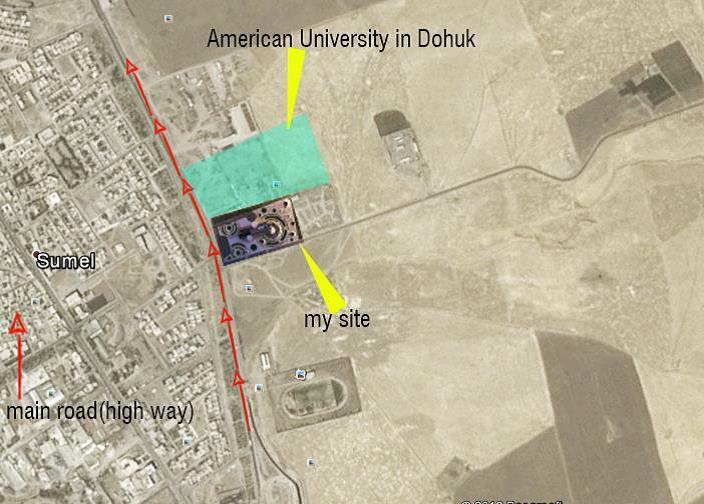 ​The site itself, of about (105,000) m2, can tell more stories of different historical, cultural and religious events. It stands in the midway between the history of Ancient Babylon and the heritage of the city of Hillah, while immortal flowing river is still holding and sharing memories within time. In Post-Modernism, human beings had been returned to be the center and part of everything around again. This paradigm shifted the view to the nature and the whole world in both macro and micro levels. Advanced developments in communications and high technologies enabled us to see and conceive things differently. ​It is supposed to be that sustained patterns and systems reveals themselves when their inner self-organized structures can match the structures of their neighbours locally and globally. Humans well-structured minds are designed to interact with natural forms accordingly. 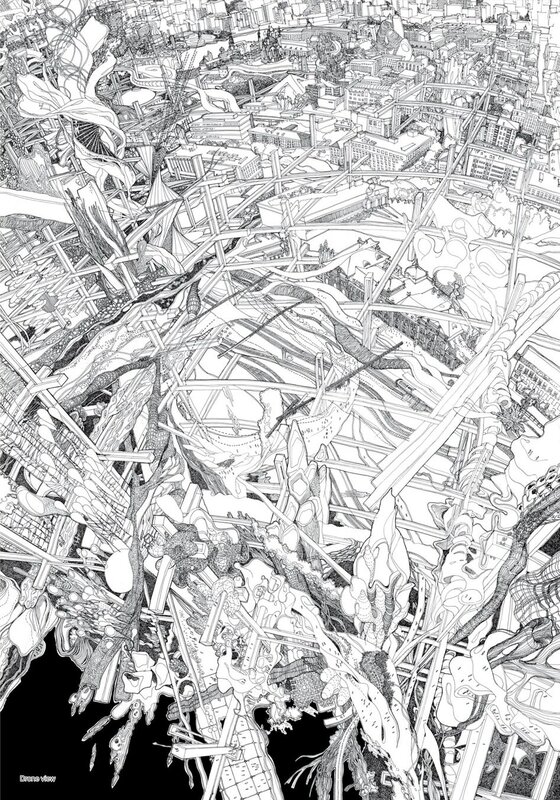 Organic forms imply continuous piecemeal changes in their morphologies. Instead of capturing change, it is possible to manage it dynamically. Secrets of life can be revealed somehow by tuning nature with geometry. The story of this project begins with the flower of life, The Chamomile Babylonian Flower, embodied amazingly in the laws of sacred geometry of Ancient Babylon. 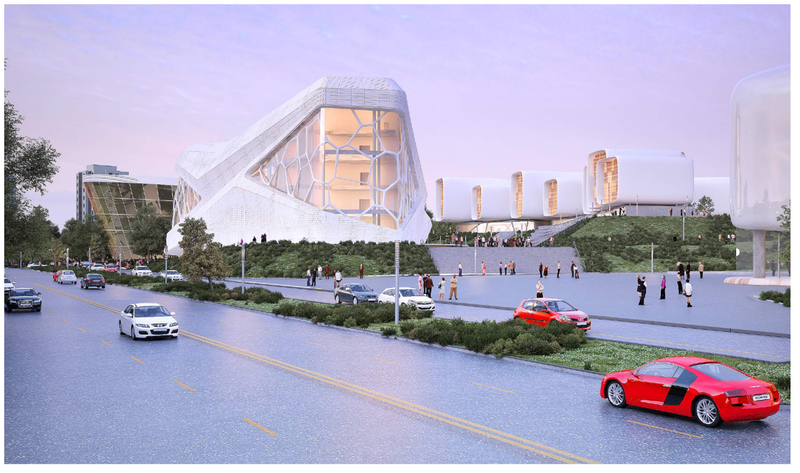 Organic architecture is manifested clearly by using organic forms which are related deeply with the iconic form of Chamomile in a significant way that tuning the site. With canonical rules and folding architecture, the whole can be merged altogether in a wonderful way to re-present life. 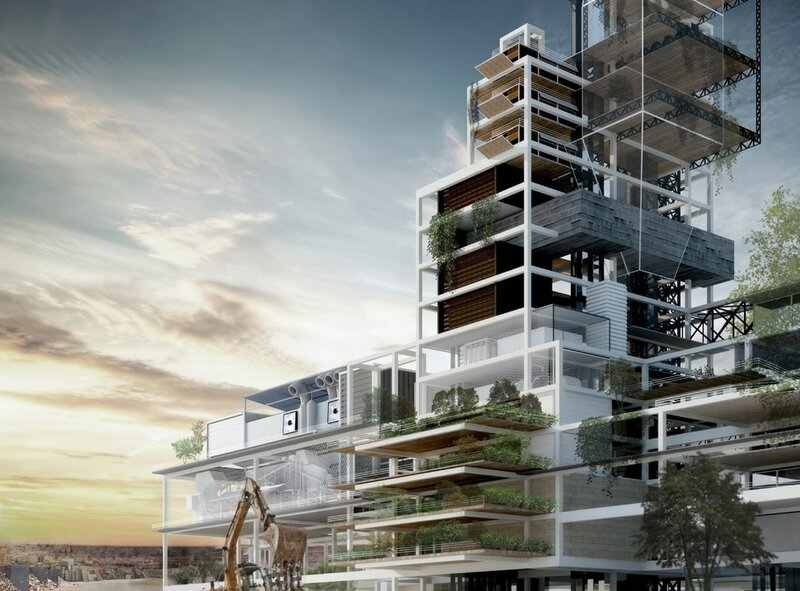 Also, organic architecture is manifested clearly here by using organic forms. In the other hand, inner activities and functions are related to the bio-electronic and digital environment trying to create virtual common realms beyond the constrains of possible. One can live, feel and enjoy his interaction with others and with the smart environment around him. Inner plan subdivisions and elevations details show a scaling Golden Ratio of (1:1.6) at each level of magnification. This multi layers sequence is manifested clearly in Chamomile Babylonian Flower of Life. In theory: It is an attempt to improve that limitless imagination always need scientific applications to be verified. In practice: It provides a mean to judge history, live the present and predict the future. Local visitors (children, youths, women…). Students, academic staff and researchers. 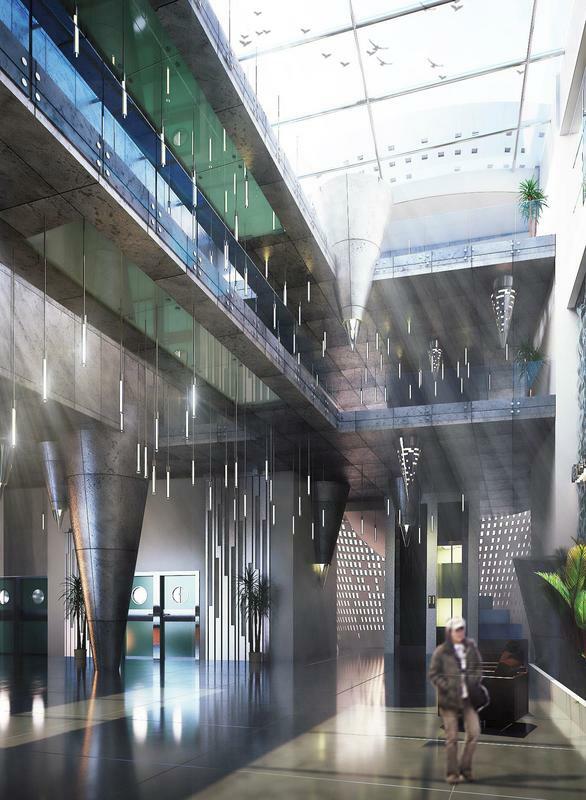 The Judging Panel’s stated that they chose this project because it proposes a brave new way of visual interaction with Babylon and is commended for its imaginative engagement with the city, the successful design process lead to proper setting of the building on site. 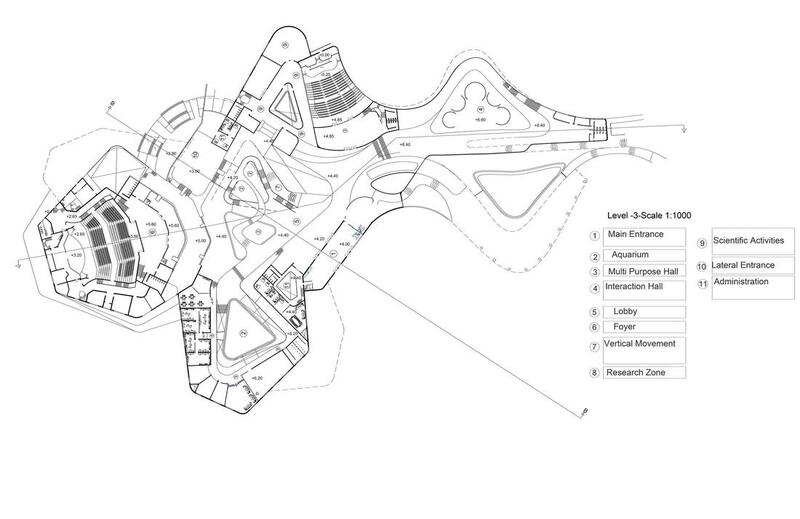 The concept of introducing usable areas around a court yard reflecting local identity is a successful design process approach, distribution of spaces and circulation is well addressed. 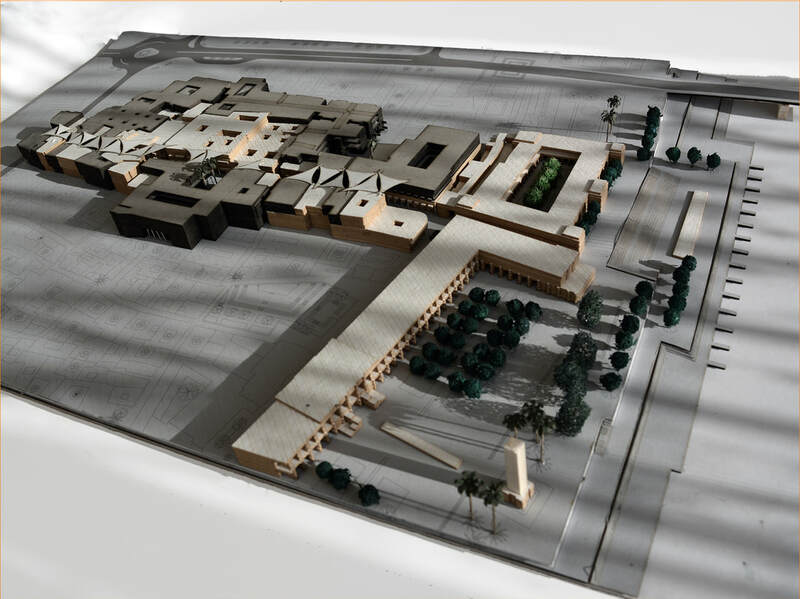 ​Ahmed Badr, Describes his project, 4000 panorama museum, as a cultural institution with civilizations that have appeared on this earth 4,000 years old, and for all historical periods beginning from the ancient Babylonian era and until the twentieth century. 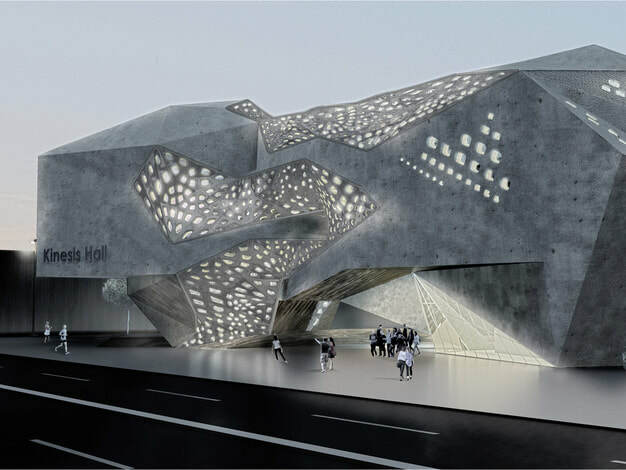 The building is a story telling masterpiece that lists the culture using various methods of electronic display and virtual reality which contains models of the Iraqi ancient civilizations. 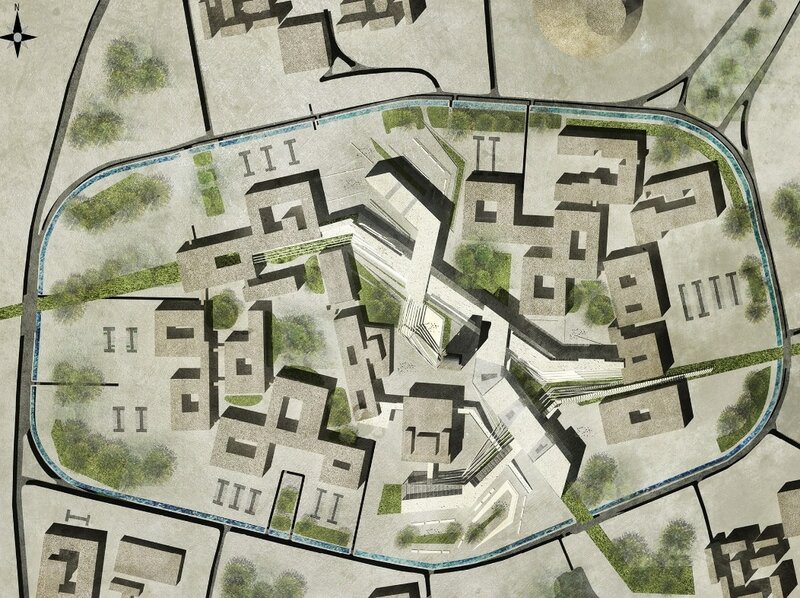 The project also focuses on the historical, cultural and architectural aspects of the city of Babylon, through the study of architecture and urban fabric of social and cultural life . ​“A people without the knowledge of their past history, origin and culture is like a tree without routes”Marcus Mosiah Garvey. When you have a history of 4000 years old, and civilization is considered one of greatest and a stronger civilizations that appeared on earth, there must be a museum that show this civilization to the world. More than 4000 years of ancient Babylon history and achievement can be illustrated chronology through this museum . The concept is inspired by the Babylon ziggurat which represented symbol of this civilization it's the connection between us and old babylon which it represented the past of us and the future of them . The museum has a metaphor of this ziggurat but with the presence look of future of past . 2- The process of rechanging the future of ziggurat ( Time effect & Redesign ) . 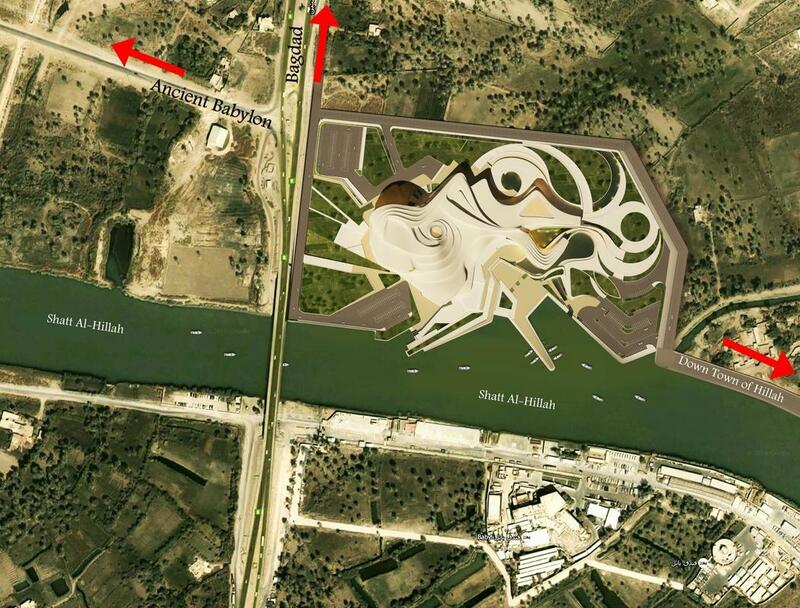 Site is located in the city of Hilla, close to the ancient city of Babylon. 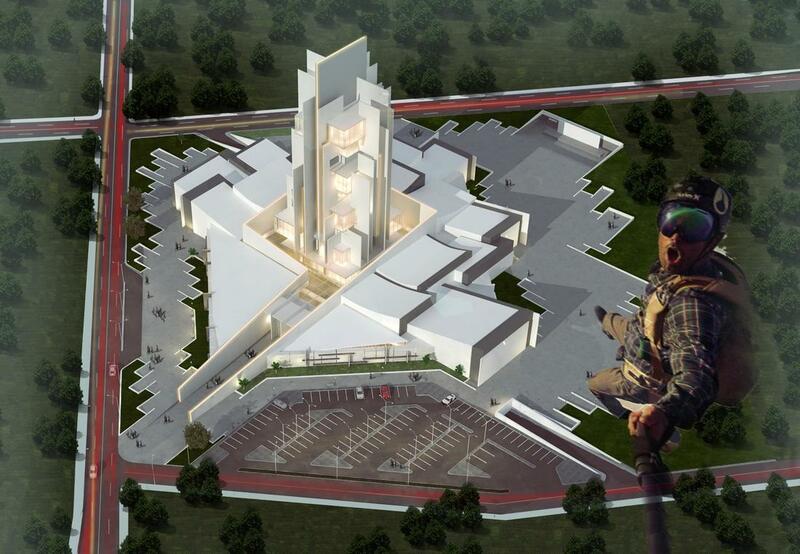 Historic goal: So as to achieve communication between the past and present through the revival of historic areas. العمل عليه لمده 4 سنوات.